“I can’t find Pluto anywhere!” – words of a grade-schooler at Hayden Planetarium. There’s rebellion in the ranks of amateur astronomy. Despite the IAU’s notorious demotion of Pluto in 2006, many refuse to accept the validity of their new definition. 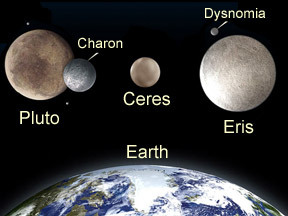 OK, when Clyde Tombaugh discovered Pluto in 1930, if he’d known what we know today about dwarf planet objects, perhaps we’d all be calling the ninth planet a “dwarf planet”. But we didn’t know anything about Eris, Quaoar or other near-planetary objects back then, and you don’t define a new class of objects based on knowledge of only one instance. This is what you get for waking up at 445AM and running out into the parking lot in shorts with a camera – the tail end of the eclipse. Handheld shot with a Canon 5D and 200mm zoom, image stabilized. We are so deadened to political and media misuse of the concept of “proof” that it is a shame we often don’t pick up on it when the conceptual abuse occurs in the scientific community. You don’t see this coming from the scientists actually making the scientific discoveries. You see it from the political and press flacks trying to leverage the event for maximum spin. The NASA statement at least makes some sense: it implies observational proof, as opposed to armchaired hypothesis and “theory”. Fienborg correctly quarrels with those who would demote “theory” to the status of an unproven and somewhat arbitrary hunch or guess – as religious literalists would have us do with the “theory” of evolution, global warming and so forth: there’s no proof; it’s just your opinion, which is no better than my opinion. As Fienborg points out, a theory is invalidated when contradicted by even one set of facts or principles. So, why make a big deal out of the misuse of “proof”? Are we just bickering about semantics? Most of us can see almost intuitively how the differences in the two approaches can determine which way the world heads from here. As a kid in college, I read Hannah Arendt’s classic “Totalitarianism” which, among many notable accomplishments, dissected in frightening detail the semantics and propaganda used to mobilize Hitler’s Germany. It was tough sledding, but I never forgot those lessons. This just reminds us all that if the concepts are popularly demolished upon which we rely so heavily to do good science, and indeed to live in freedom, then it scarcely matters how good a grasp we ourselves have of those ideas. Bereft of a common language to communicate them, we are just as effectively censored into silence as if the old propaganda polizei held the button to the microphone. If it’s “proof”, “stronger proof” invalidates the whole concept. Yes, NASA requires a much more complex checklist of conditions that must be satisfied, than I required to tune my ’84 Bronco (back in the days when you could tune your own engine). Proof still doesn’t come in degrees of certitude, or household vs. industrial strengths. It’s either proven or it ain’t. You only get to hear the fat lady sing once, if at all. You can fool some people some of the time, but you can’t fool the fat lady. After the weekend showers the day skies have been crystal clear, but the nightglow persists no matter what, I suppose. It was an average viewing night. I could clearly make out the top three stars defining Cassiopeia, could barely make out the fourth, and just couldn’t quite see the bottom of the famous and easily identifiable W.
With the naked eye I kept thinking I saw a fuzzy patch about where I imagined I have seen Andromeda. With the skyglow and the earliness of the evening, I didn’t believe it, so I went and got the binocs, and there was nothing there. While using the 15×70 Orion Little Giant binoculars I was of course hoping I would then see Andromeda. I never look in the right place, so I have to go indoors, check Starry Night Pro, and go back out. I’m indoors now (natch) and not planning to go back out again until just before bedtime. But a gray, swept-wing silhouette of a large jet flew into my field of vision. As far as I could tell, it had no running lights. It was too high to hear any sound. 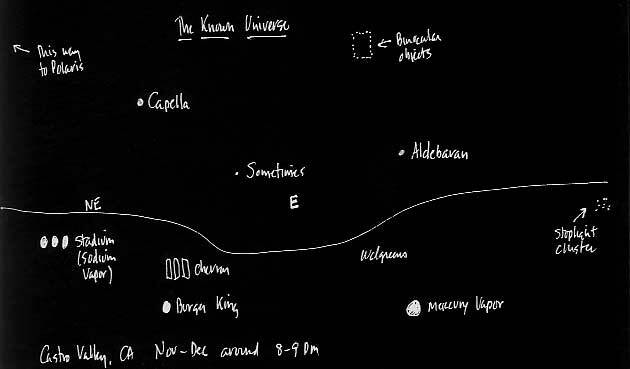 And tracking it led me right past the North American Nebula (according to Starry Night Pro). When learning the night sky, I’ll take any stage props I can get. Below Cassiopeia (as it rises in the East), cascades a long spilling trail of stars down into the rising constellation Perseus. It is quite rich. I call it Yosemite Falls, and on a clear night you can practically hear it; in fits of romantic fantasy I imagine the sound of wind chimes. I suspect this area is part of Perseus, but without more careful study I couldn’t say for sure. I wouldn’t say it was scintillating tonight, but with the 15×70’s it was still a delight to see. Even with average urban night skies, and a little patience, there is always something so see. Maybe I won’t wait for bedtime to go back out there after all! There hasn’t been any real activity in the Astronomy department in about a year. It’s not for lack of interest. I just haven’t been doing any observing lately. Beyond the metropolitan skyglow and pathetic Clear Sky clocks, I spend as much time as ever “armchairing” the universe through the magazines, internet and an occasional new book. The last time I set up a telescope, Bob was still alive. I had to have him act as “spotter” as I hefted our massive Orion 10″ reflector and guided it onto the Atlas mount, down here in Phoenix. After dark, the sky didn’t offer a rich selection of targets, but mighty Jupiter shone brightly in the southeast. This was “first light” for the Atlas/Orion, and I got a rough polar alignment on the mount, and tracking seemed to work great. Jupiter swung into view, and I switched to the highest power eyepiece I thought traffic would bear. I refocused and held Bob steady so he could look through the eyepiece. “Oh my GAWD!”, he exclaimed, and I was rewarded with one of Bob’s increasingly rare genuine smiles. It was a truly beautiful sight, and a grand way to remember the last time he looked through a telescope. People who have been together for a long time naturally divide up tasks according to what they do best. 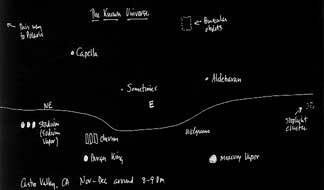 I was best at star charts and celestial mechanics. Bob was best at setting up and programming the AutoStar device for our Meade 8″ SCT. The device, which remains a thorn in the side for me, is remarkably similar to a TV remote. That was right up Bob’s alley. In the old days, I would do the mechanical setup, Bob would initialize the scope’s computer, I would find objects like Andromeda when Autostar didn’t seem to, and we would share observational delights. I won’t pretend that half the fun of observing isn’t sharing with someone else. I still have the scopes. I will set up the Meade again, probably on vacation in October. I’m not confident I have the strength to set up the 10″ Orion without some help. The penalty for dropping an OTA is just too steep. There’s enough fun in entry-level observing to keep me going for a long time, when I get back into it. For naked-eye observing, last night was exceptional. I enjoyed a late night dip in the pool (it will soon be too cold for the pool) and saw Cassiopaea, the full sideways “W”. I knew Andromeda is somewhere to the east of that, but I wasn’t trying to identify objects, so much as enjoy. The night sky was fairly crystalline. Sometimes just looking in wonder is enough for me. I do my eyedrops in the morning. They take two minutes, eyes closed. I like to do this routine on our celebrated apartment balcony while I marshal my resources for the commute and day ahead. It’s quiet and peaceful at 5:30 AM, and still a good half hour before first twilight. When I think two minutes are up, I open my eyes. At that point, I have great night vision. From the balcony we can see from a little west of North to about southeast. Being a second floor balcony with a third floor balcony above, the vertical sky is limited to about 45 degrees elevation. This morning was exceptionally clear. I could see the familiar twins Castor and Pollux, with bright Saturn currently below and a little south. The Big Dipper was plainly visible, and probably the Little Dipper hanging down underneath Polaris, when I learn to pay attention. Standing on the north balcony edge, Cassiopeia was plainly visible – all 5 points. The ‘W’ is flipped in orientation from the evening view, and so looks like a lopsided ‘M’. No binoculars this morning. 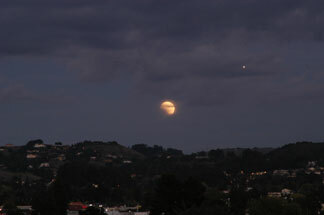 For Castro Valley, this was naked eye observing at its best. Rats, time to shut down the house and leave for work. Stepping out onto the parking lot on the SW side of the building, I am treated to the bright three-star belt of Orion, and the whole of Orion as well. If I’d paid more attention and shielded my eyes from the parking lot lights, I would have seen Taurus and my friends the Pleiades a little to the west, as well. Here, it doesn’t get any better than this! It was a great day at work, too. I was jazzed all day. Here we peel back the sordid, squalid, seamy underside of practical amateur astronomy. In a world of GPS GO-TO computerized alt-az mounts, 16″ dobsonians, and stacked CCD image processing, some us – by choice or by force of circumstance – have adapted to naked-eye, visible-sky observing. 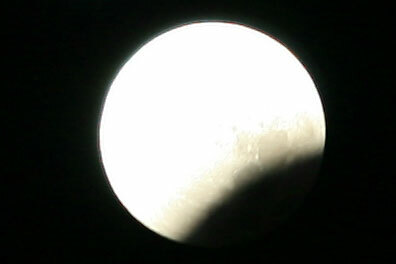 We didn’t have time to really prepare for this, the last full lunar eclipse until 2007. I was able to set up the D100 digital camera on a tripod. 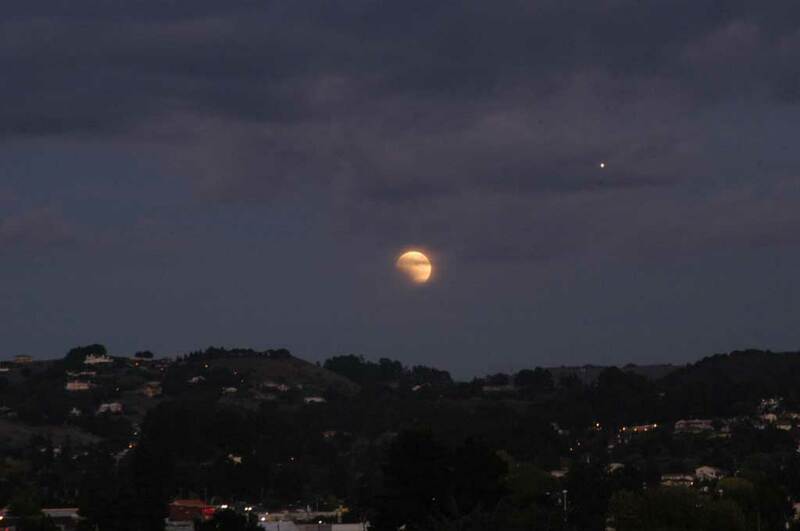 This shot was captured shortly after sunset (taken at about 6:25PM Pacific), over the hills east of Castro Valley, California. The bright dot to the upper right of the moon was a jetliner. This shot was captured at ISO 800, 1/20 sec, f10. The moon disappeared shortly after this picture was taken, but came back later. Exposures up to 2 seconds later caught the red glow, but I didn’t use a remote shutter release and there was some blurring, so I’m not posting here. For a large 1024×768 verion of this JPG, click the image to the left.